Almost 900 men and boys went to work at the Pretoria Pit on 21 December 1910 - 344 never returned home. A huge explosion at the pit, officially named the Hulton Colliery, on the outskirts of Westhoughton, Bolton at 0750 GMT was the third worst in British mining history. It had a devastating impact on the town, with almost every family knowing someone who had been affected by the blast. The youngest victims were just 13, and the eldest 61, Pam Clarke, chairwoman of Westhoughton local history group who has researched the disaster, said. One woman, Miriam Tyldesley, lost her husband, four sons and two brothers. Her loss is remembered with a memorial in a cemetery in the town. Wingates Brass Band, based in the town, lost seven members. Councillor Brian Clare, a local historian and expert on the disaster, said: "The impact on the minds of Westhoughton men and women, and the children was devastating. It still is devastating to me. "I think it is of major importance that we never ever let what was the greatest mishap of this town disappear." Mr Clare, who is also Mayor of Westhoughton, is due to unveil a memorial to mark the centenary of the disaster, commissioned by Westhoughton Town Council, on Sunday. 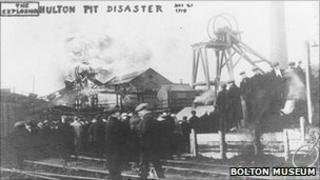 Alan Davis, former curator of Lancashire Mining Museum, said the explosion was caused by a roof fall breaking a miner's lamp. The broken lamp ignited gas in the mine, which led to the coal dust igniting and spreading through the tunnels. "Most of the men who died in the disaster were suffocated due to carbon monoxide poisoning," he said. "The men who died very close to the blast suffered most. They suffered horrific blast injuries. "Some of the men managed to walk up to 300 yards after the explosion and then were overcome with the fumes. They were found as though they had gone to sleep." Mr Clare's mother told him about her memories of the blast. Aged eight, she was getting ready for school when she heard "a terrific explosion", he said. "She thought it was thunder and lightning. In actual fact it was the pit going. "She ran to my grandmother. When they looked through the window all the neighbours were coming out with their shawls. "They knew exactly what it was. They all made their way to the pit." More than 100 rescuers tried to rescue the boys and men, led by the colliery manager Alfred Tonge. "By lunch time they knew there was no possibility of survival at the bottom level," Mr Clare said. From then the rescuers worked to remove the bodies. One body has never been recovered and 16 were registered as unknown men, Mrs Clarke said. It took weeks to bury all the bodies - 229 were laid to rest in Westhoughton. There were so many funerals that many had to be held on Christmas Day. Ben Byers, who lost his brother Fountain, 33, in the disaster, is heard in an archive recording describing Christmas Day 1910. He buried his brother at Wingates Parish Church. "Funeral processions were crisscrossing one another to all respective denominations which made it all the more depressing," he said. BBC Radio Manchester is marking the centenary with a documentary about the disaster on 30 December at 1500 GMT.